So what do you do if your dad is a retired physician, or your mom is a pastry chef? 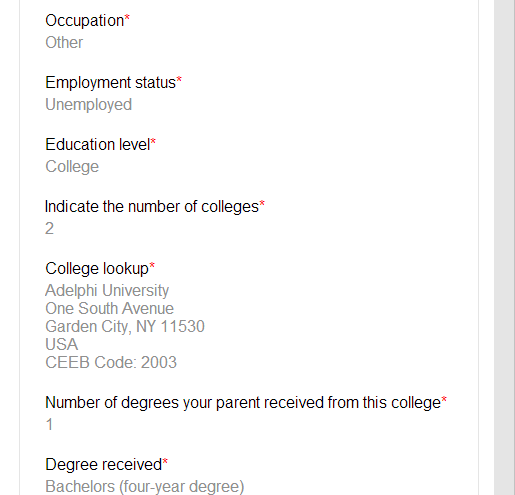 While the application used to provide a place for students to enter their parents’ specific job titles, now you must select from one of 45 generic job fields, such as “business executive” and “semi-skilled worker.” Scroll through the entire list (enlist mom or dad’s help if you’re not sure! ), and chose the options that seem to best capture your parents’ job responsibilities. Keep in mind that “other” is always a possibility. As for mom and dad’s educational backgrounds? If either parent attended both an undergraduate and a graduate school, be sure to select “Educational Level: College” and “Number of Colleges: 2.” You will have the chance to include both educational institutions later on. In the first release of CA4, this question, hidden innocuously on the “Tests Taken” tab, caught most of us off guard. Recently, however, the Common Application has clarified their language. The standard leaving examinations questions is only applicable for international students. Domestic students should leave this question blank! The Common Application gives you room to list 10 distinct activities on their built-in résumé. 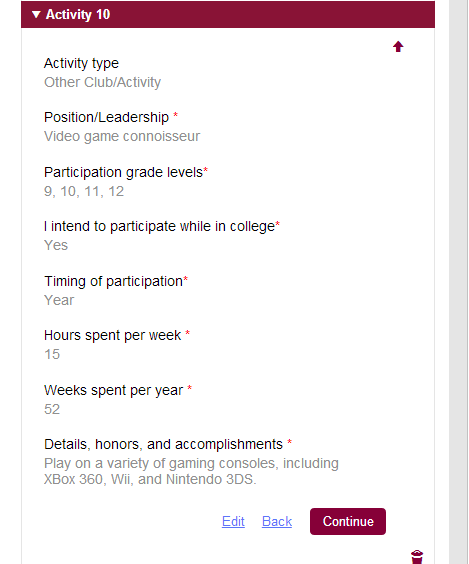 So let’s imagine that you are filling out each your clubs, sports, and other extracurricular involvements while also texting a friend when you realize that “Video game connoisseur” perhaps shouldn’t be included in your top 10. And right now, you have it listed as “Activity 1.” How do you delete it? If you don’t have another activity to put in its place (i.e. you have nine solid activities to list, but not 10), you will first need to hit the “edit” button at the bottom of that page. Then hit the “down arrow” located in the upper right-hand corner. Once you move “Video game connoisseur” all the way down to the last position on the page (in our scenario, Activity 10), you will see a little trash can icon appear at the bottom of the screen. Hit that, and your list is good to go. Looking for a quick and easy way to determine which of your colleges require the submission of additional essays? Click on the “My Colleges” tab. If you see “Writing Supplement” as an option underneath any of your schools, you’ll definitely have additional writing to complete. However, if you don’t see “Writing Supplement” under a particular school’s name, there’s still a chance that extra essays are required. Sometimes essays don’t show up until after you’ve selected a particular major or unique academic program (such as a combined BS/MD or honors program). You’re ready to submit your application when all of a sudden you see the following message: In order to begin the submission process, you must first have the following items completed… How do you know what’s still missing from your application? Unfortunately, blank fields aren’t highlighted in a visually striking way, and it can be a little tedious trying to find the one final question that still needs answer. Our suggestion? 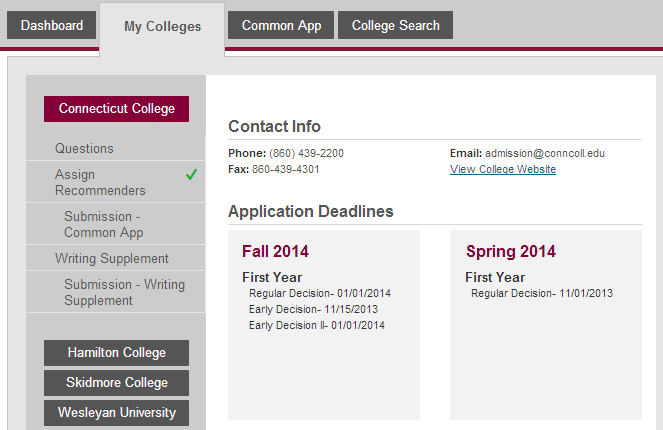 Click on the “Common App” tab first. If any of the items to the left lack a green checkmark, select it. Then click in the first drop down box you see. Hit the “tab” key on your keyboard until a red X appears, indicating a required field you inadvertently missed. Alternatively, just scour the screen for those tiny red asterisks, as those also indicate questions that must be answered. 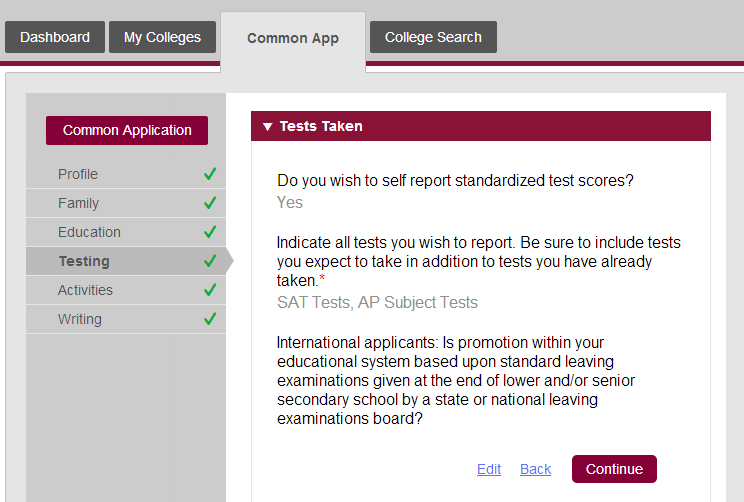 Once you see six green checkmarks to the left, follow the same procedure under the “My Colleges” tab. Once every item has a green checkmark beside it, you should be free to submit your application. 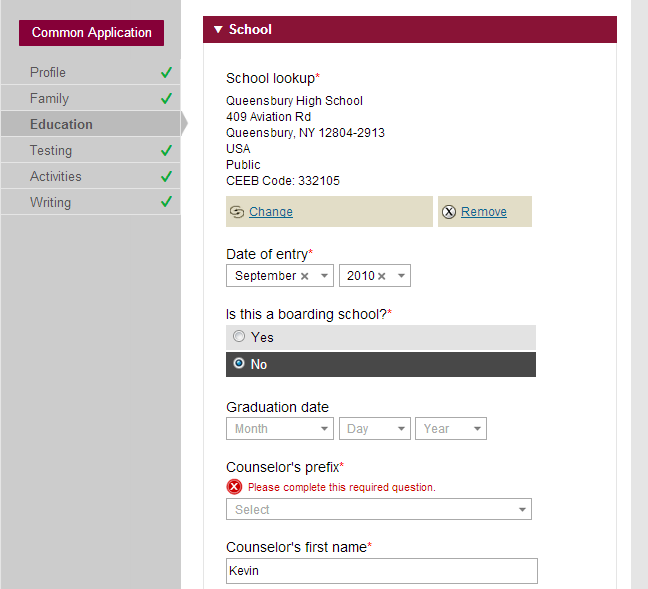 Do you have additional questions or insights about the new Common Application? We welcome your comments below!